Ombre is a popular technique wherein the hair color fades from darker roots to gradually lighter ends. (Thus, color that goes from lighter to darker would be a reverse ombre, right? An “erbmo”, perhaps?) The ombré fade is usually on ½-2/3 of the hair, and goes in a fairly straight line across the hair. Dip Dye is similar to ombre but doesn’t affect as much of the length of the hair, only going about 1/3 of the way up from the ends. It’s often used with the crazier, more vibrant colors, making the hair literally look as though it’s been dipped in paint. Balayage can describe a wide range of styles, but is most often used to describe handpainted, natural looking highlights that reach varying heights in the hair. They’re often of the blonde variety. I decided to try a look that combines varying elements of reverse ombre, dip dye and balayage. I used RP3 Royal Purple from Bigen Vivid Shades Semi-Permanent Hair Color, which I can adjust later as needed since it’s a semi-permanent. 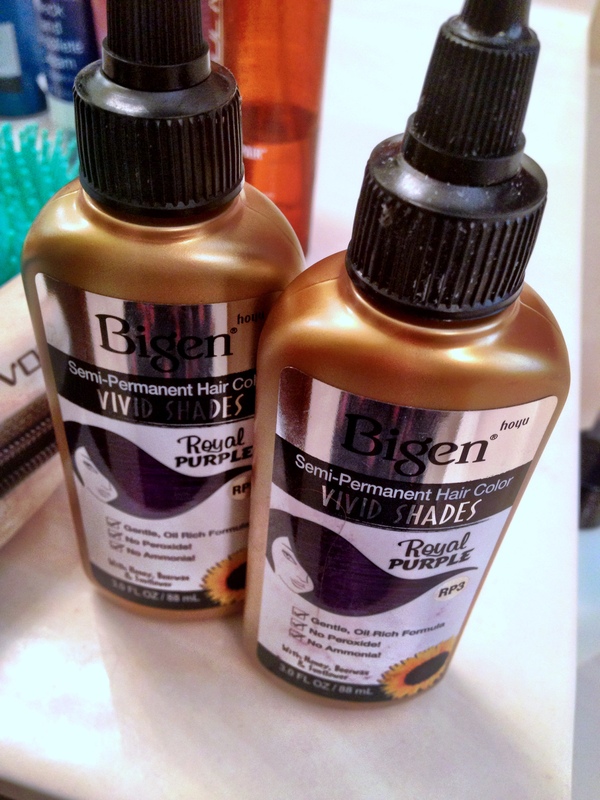 I’d never tried Bigen before, but they have six shades in their Vivid line perfect for that oh-so-right-now way to show your wild shade. The bright purple gave a dip dye effect, and it works really well with my auburn locks – it’s a subtle, beautiful transition that I enhanced with some balayage style painting. Step 1: Plan your color. Google Image Search up the colors you want and find a hair model. If you can’t, then plan carefully exactly how you want it to look; for example, how far up would you like the color to go? Since I knew I’d be balayage-style painting different lengths, I made pigtails at the highest point I wanted my color to come to. Prepare the area as you would for any color, and wear something you don’t care about. Also, don’t forget to use GLOVES! Even though Bigen’s formula is designed to reduce staining, any stain is undesirable. I’ve even had hair color stain my nail polish before! Seriously, gloves. You can buying them in the cleaning products section of your local superstore. Step 2: Begin to color. Stack the mass of the color at the ends, and leave it just on the lower section for 5 minutes. After that point, you can begin blending the color upward. Use a comb or small brush (a marinade brush actually works really well) and focus on the section where the new color hits your original color. We need this to be a smooth transition, and the brush will help the heights vary in a natural way. 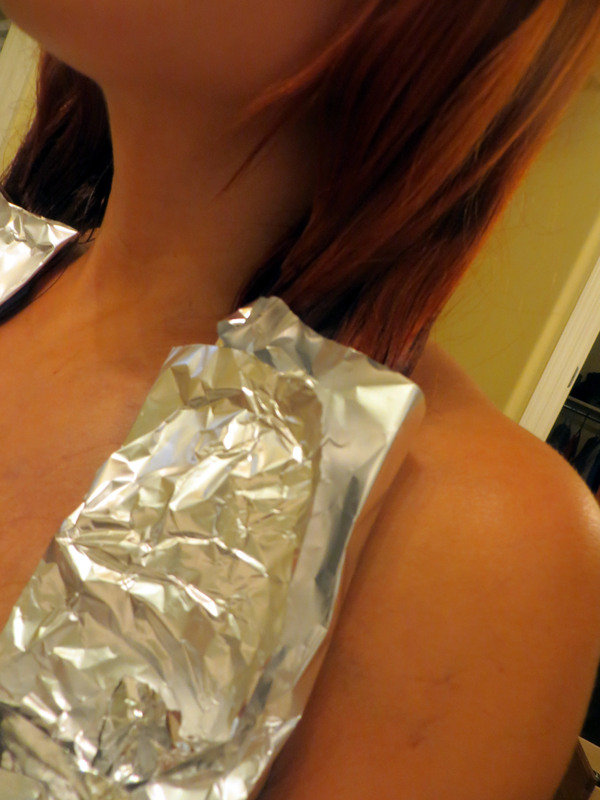 Section the hair into top and bottom sections so you don’t miss anything, and foil-wrap them when you’re done. Let develop 20 minutes; I waited until halfway through at 10 minutes, then enhanced the blended effect further with my own specially developed washcloth technique. 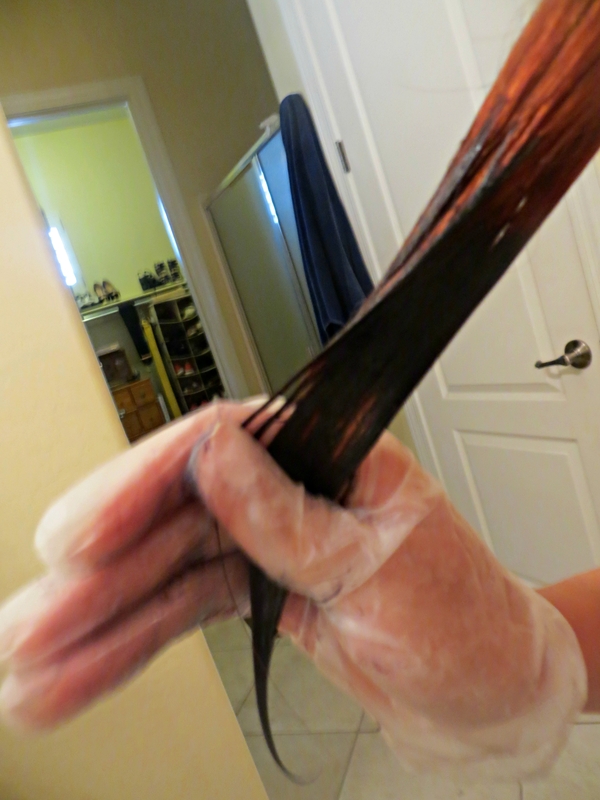 See, if you went to a salon, they might use a third color in the transition to make it seem more natural; but since we don’t have access to that, I simply wet a washcloth and stroked it through the top 1 inch of the transition in a downward motion. This pushed the excess color out of the top part of the transition, but in a natural blended way. 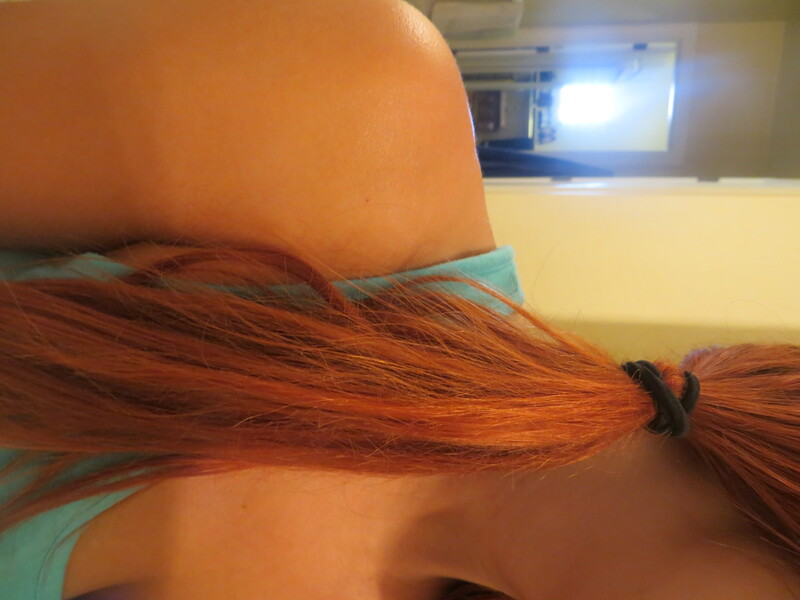 Since that hair only got half the development time, the color was naturally a more faded, in-between color. Perfect! Now just let it develop the remaining 10 minutes, for a total development time of 25 minutes. And the results? 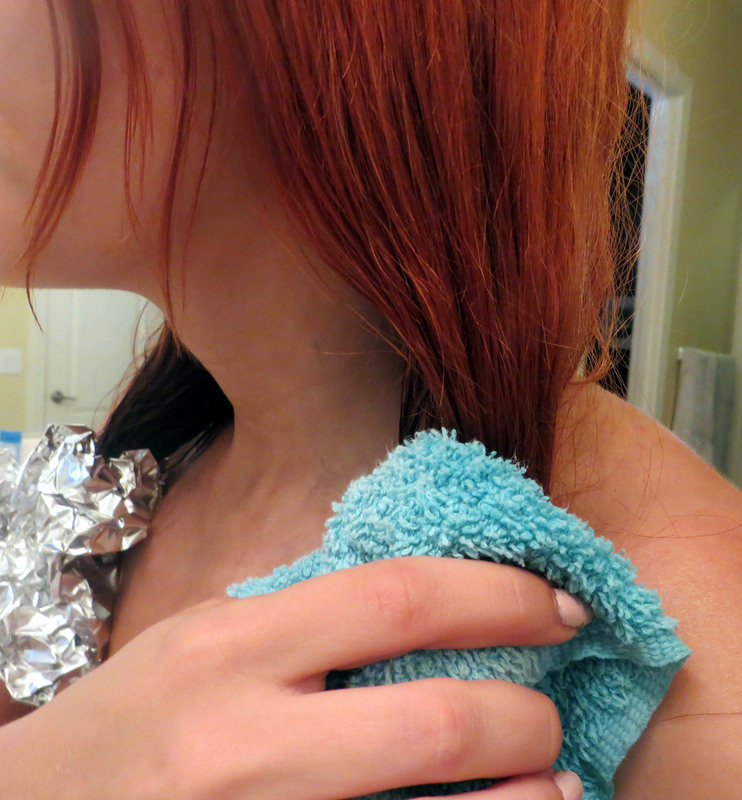 I am stunned with how easy this was to complete at home – even for a hair-challenged girl like me. Plus, I’ve avoided making crazy color changes because I was afraid of damage, but with this gentle, ammonia-free formula, I don’t have to worry about it damaging my hair. Bigen Vivid Shades semi-Permanent Hair Color allows you to “Break From the Herd” with 6 bold and bright shades that let you show your wild side. Conditioning, oil-rich formulas with no ammonia and no peroxide are so gentle on your hair you can color with confidence. Thanks very much to Bigen for sponsoring this post and showing me how to #BreakFromTheHerd. OH MY GOD your hair looks FANTASTIC like that!! I loved it before, but now I think I love it even more!! I don’t think I could pull something like that off myself though. I bet you could, Angela! If I can do it, anyone can! I’m not handy with my hair, remember?